The Buckeye Star and Gilbert Sun News interviewed local school officials to learn more about the impact of DCS. 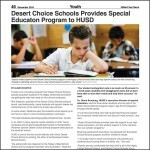 A recent case study by Johns Hopkins Center for Research and Reform in Education demonstrates how Learn It’s Desert Choice Schools (DCS) partnerships are creating positive behavior and academic outcomes for students with special needs while also saving its school district partners substantial monies. Conducted by one of the nation’s leading authorities on education programs and policy, the research team studied the Desert Choice Schools program for students with emotional disabilities, autism and other behavior related challenges. The program, which has been operating in Arizona for almost a decade, uses a rigorous positive behavior support program to teach students how better to self-manage their behavior. Enter email below to receive a copy of the entire report.